Welcome and thanks so much for stopping by! to share their spring decor this week. accessories on a whim to create a totally new look. of patterns is a fun day in my book! texture that compliment anything I put with it. I was inspired by the cover of the book, Modern Mix by Eddie Ross. 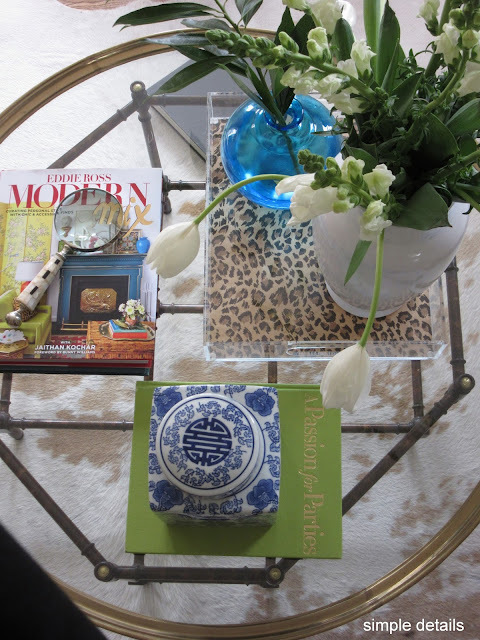 coffee table to give my living room a little dose. column I've had for years for that effect. that I'm using as a side table. So, I know it's a bit on the neon bright side, and the jury is still out. dull and muddy. Maybe dull and muddy would have been good. Haha! and made me this cute origami elephant! I love it, thank you Sarah! I always plant wheat grass, it's fresh and springy and you can't beat the texture and price! I am absolutely planting a forsythia bush this year! My sweet client gave me these, aren't they beautiful, I love the lively burst of color! DIY Hood, Formica Countertop, Painted Tile and lots of easy budget friendly ideas. different vases for utensils and greenery. Thank you all so much for stopping by our tour! client projects I'd love you to follow along. Next up on the tour is sweet Laura @ Decor to Adore. Sharing with Thrifty Decor Chick Best of 2016! Stop by to see more inspiration! Lovely! I'm in love with your home! LOVE the dining room. Perfect for Spring. I really love the green. I can imagine that it takes time to get used to for you but my first thought was how much I love it. I painted the back of my desk the dull and muddy version and wish it was more like yours ;) Your home looks beautiful as always. gorgeous as always, pam! and i think the dining room is so unique and so fun and i am SO glad you went bold! 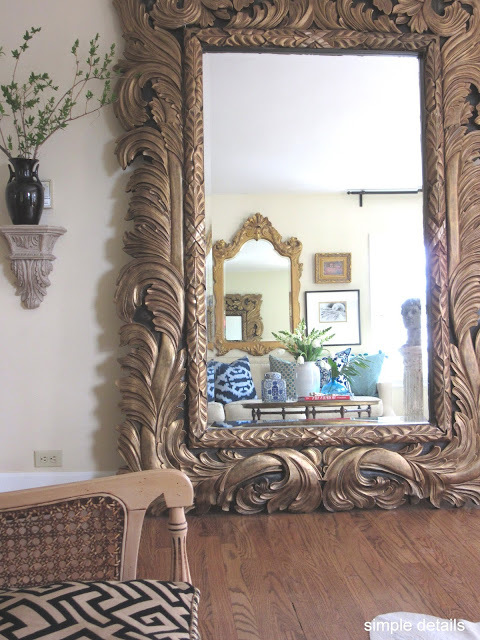 in a blog world full of white walls (i am guilty over here!) it's refreshing to see! Positively stunning, Pam! You have great taste. Have a great week. Pam I think the green dining room is so refreshing!!!! 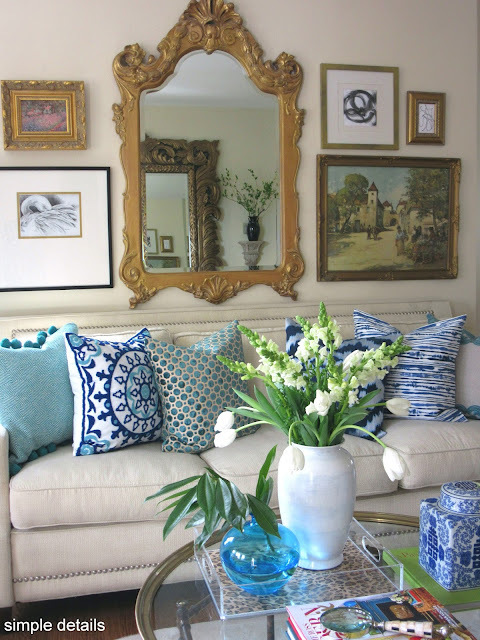 Especially with your white curtains, trim and buffet - it's fun and fresh, and I love how you carried that color and blues throughout the rest of your house! 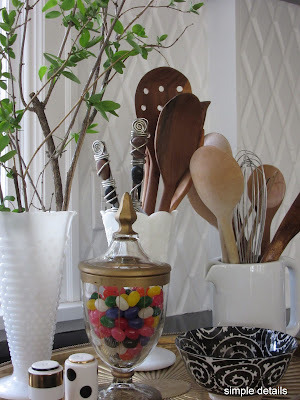 You are so amazing at changing up and styling a space!!!!! You went with the green! I know spaces always feel different in real life than in pics but I truly love it! I'm also loving your mix of pillows for spring and crush hard on that brass chest every time I see it. Beautiful tour Pam! Very beautiful! It's all so crisp and fresh! I think you nailed the dining room. I love the color and it all blends well. great job on everything! It's all so pretty Pam! Happy spring my friend! Absolutely beautiful! That kitchen of yours is just stunning. Pam... love love love the new color in the dining room. With the blue accents beautiful!! I say it's a keeper! Thanks for sharing your home with us. Happy Easter! Look at you being a trendsetter! Watch out world, chartreuse walls are coming your way! I never get tired of seeing your beautiful house and thrifty switch-ups. 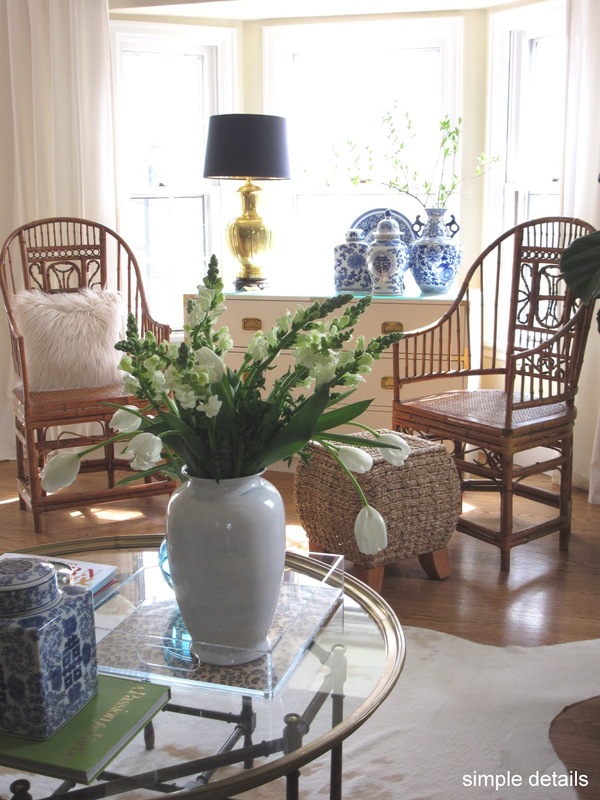 I love, love, love the green, you've used it so beautifully in every room. 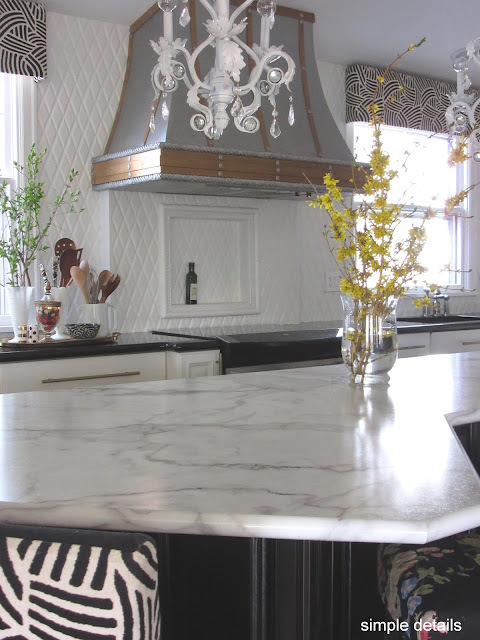 Of course I always drool over your fabulous kitchen, still my favorite room. Thanks so much for joining the tour. You are the QUEEN of Craig List! It's amazing what you can do! Everything is gorgeous. What a wonderful tour! I love blue and green paired together. It feels so fresh. I love your kchen hood but I haven't been successful in searching your site for the DIY details on it. Would love to hear how you transformed it! Your spring home is so fresh, Pam! 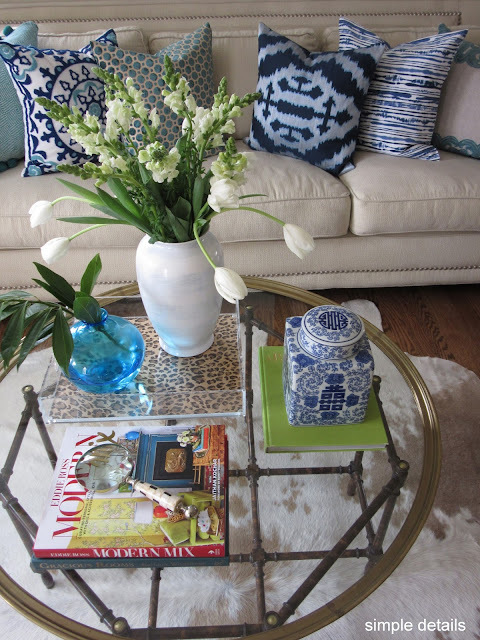 I love your use of natural textures paired with the blues and chartreuse. Have a great Easter! Wow, I had a pin fest today on your blog. 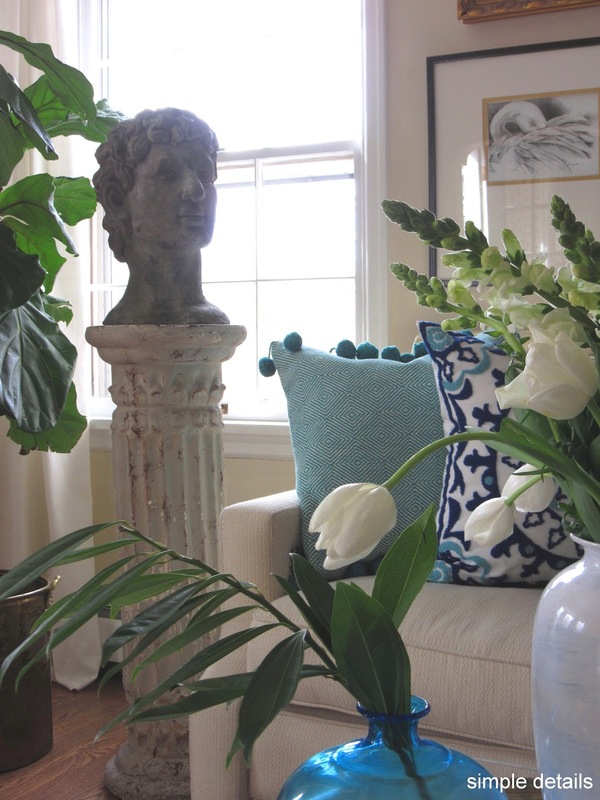 I loooove all your colors and vignettes...but most of all, I love the green in the dining room. Perfection! Thanks for sharing. So very pretty. It looks like the very essence of the season! Oh Pam I think the green is perfection in your dining room. It is not too bright or muddy. At least in the photos. In person it might be different :) Your home wows per usual! So pretty and fresh, Pam! I love the green and the beautiful styling. Your dining room is always one of my favorite rooms. In fact, I could just live in that room. Move over Rio, I'm packing up now! I think your dining room looks ABSOLUTELY FABULOUS! I hope you give that green a chance -- I love it! I love the green!!!! It's so fun, and I love how it plays off of all your blues and other greens! You are absolutely the Craigslist Queen. If the people that sold you those items could see them now, they'd totally want them back realizing they got rid of something too good! Pam I love your green!!! OMgosh I adore how bright it is too. Green is my favorite color. The whites and blues look so fresh with it as well. You have a lovely home thank you so much for the tour! I love your style. The green dining room is great. Don't change a thing. 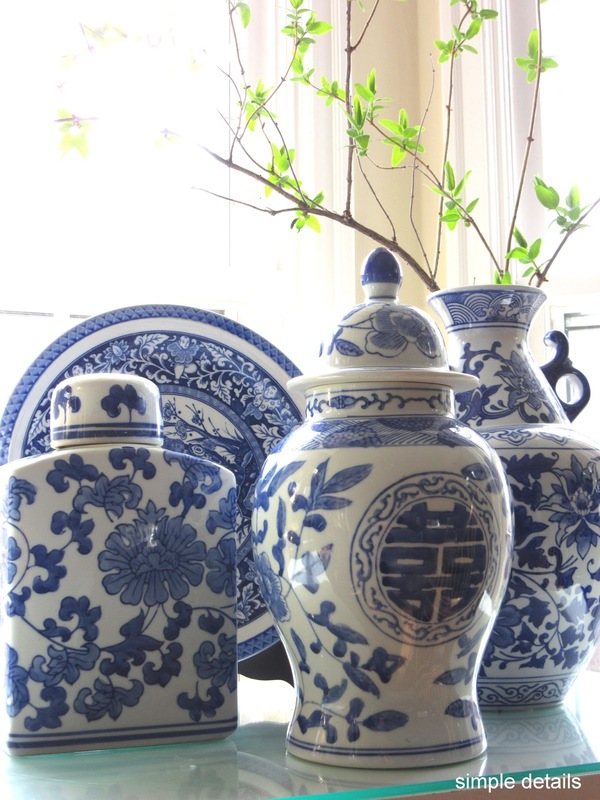 I'm a big fan of blue and white. Your mirrors and all accessories make a great statement. I like the chartreuse and leopard in your room too. 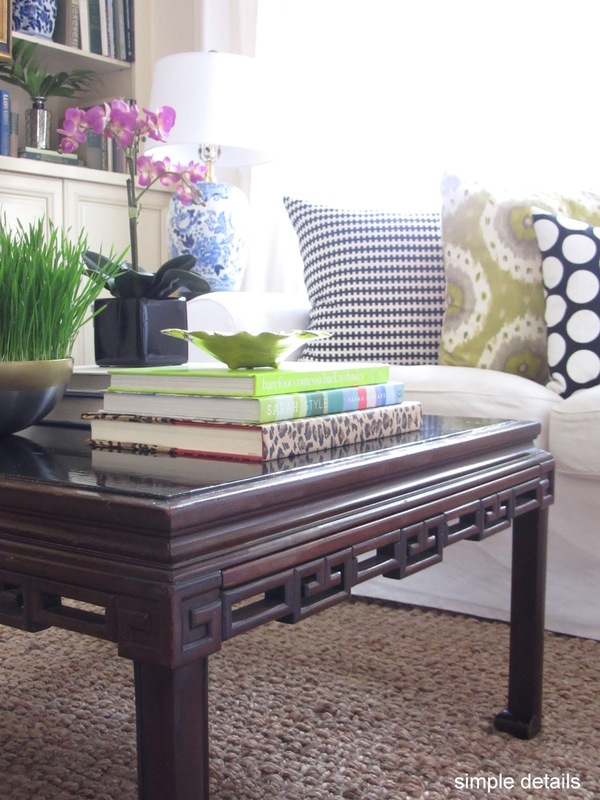 The fresh grass is a nice natural touch and your great glass coffee table full of books look super. Your kitchen is beautiful! 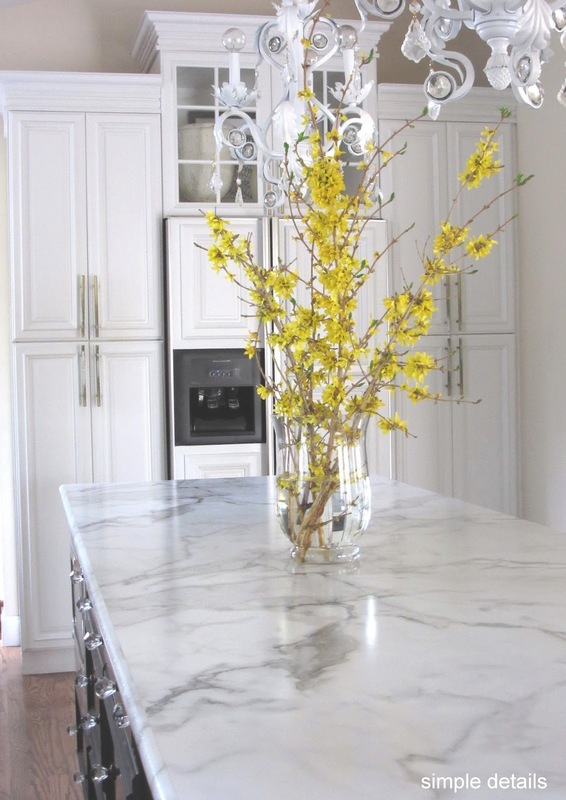 Love the marble countertop and vase of forsythias. Cute hobnob vases. Hi! Pretty tour! Just stick the forsythia in a wet spot on your property once you're finished with it in your vase, and it should root itself. I di it every year, and my forsythia is massive now! I probably wouldn't have liked the green paint in the can but I REALLY like it especially with the blue accents! Great choice. Daffodils and forsythias are the ones that tell me Spring is here. I just bought my first ever forsythia plant, I'm sure I'm going to enjoy it. 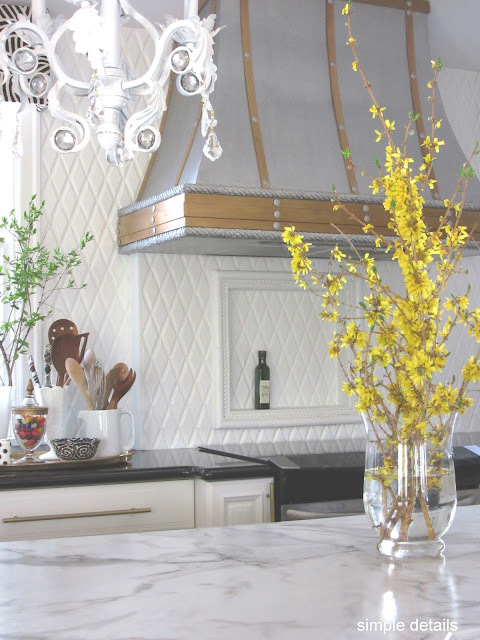 I love how the yellow branches look in your beautiful kitchen. 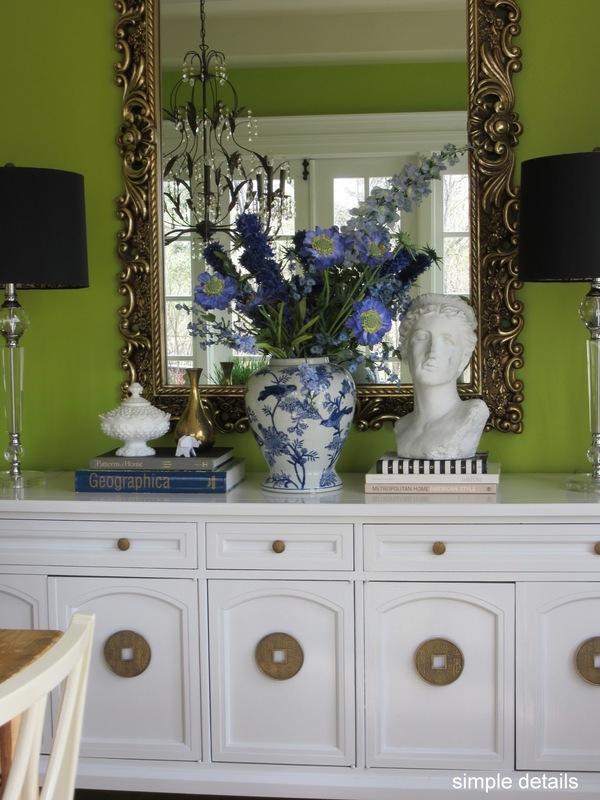 And talking about color, that green in your dining room looks fresh, inviting! I am loving all the blue and white with the green! Your home looks stunning as always and you are inspiring me to add more color in mine! 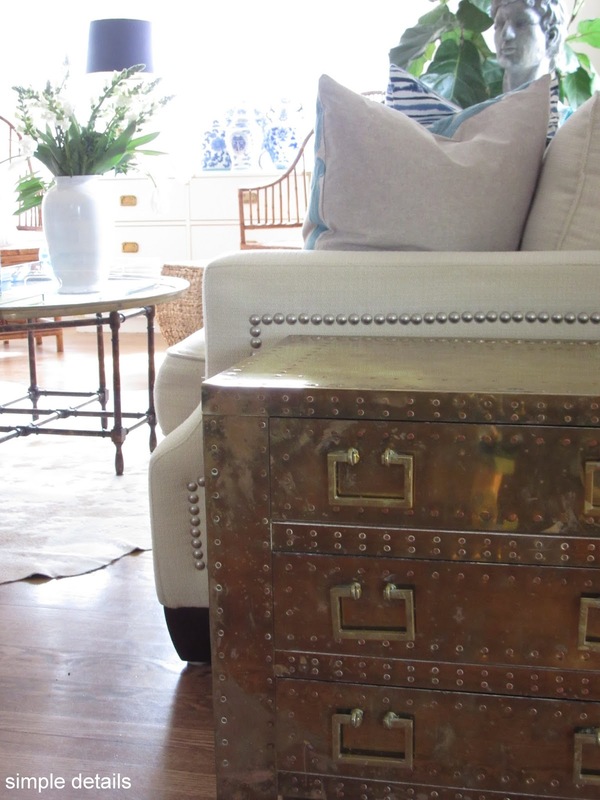 I love your eclectic style and all of your Craigslist finds are SO GOOD!!! 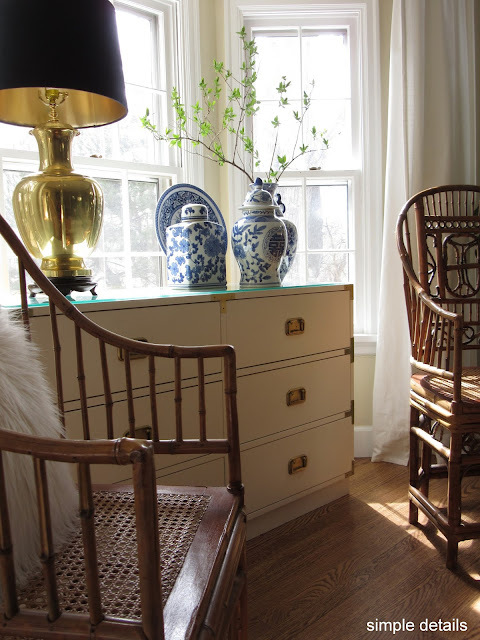 Loving the new paint color in your dining room too! We really should meet up sometime! We're so close to each other! 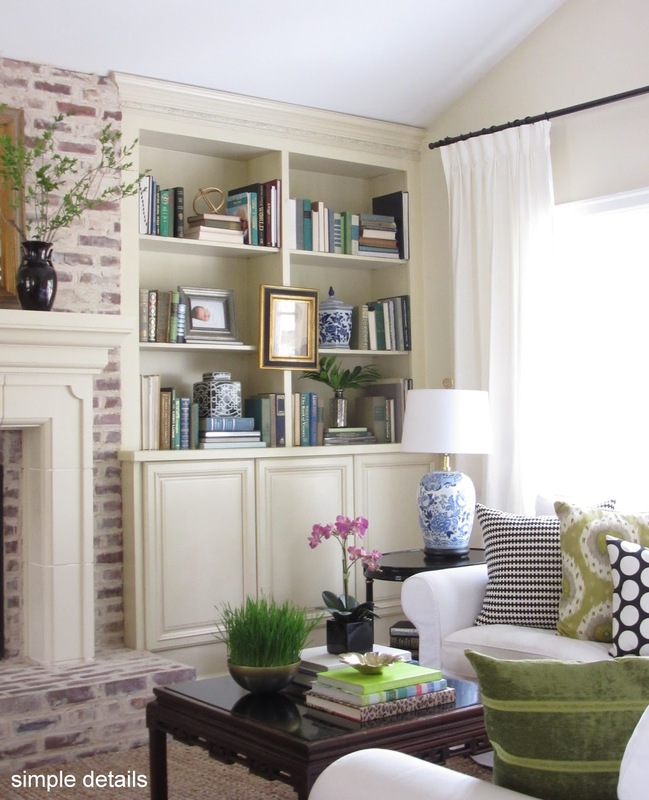 The wall over your couch is one of my favorites. Your home is so pretty. Your home looks beautiful. Thanks for sharing. Your drapes, are they sewn onto rings? Each room and every inch of your home is truly magnificent....I love the dining room wall color! Blue and green is one of my favorite color combinations in decor! I love, love, love that blue pom pom pillow, the brass trunk, and bamboo chairs in your living room! Thanks so much!! No, they're clip on rings. Both drapes and rings are from Ikea.